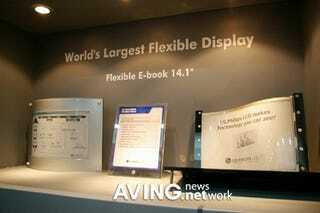 LG Phillips just announced their 14.1-inch WXGA flexible E-book at IMID 2006 (International Meeting on Information Display). Besides 14.1 inches taking the crown as the largest E-paper display yet, it's completely flexible (though, maybe sticking the prototypes in hard cases isn't the best way to highlight this feature). The 300ms response time is still pretty far from displaying video, but any content needing a constant refresh will nullify the main power benefits of e-paper anyway. We're just one step closer to the Holy Grail of electronic displays: crumpling them up throwing them in the trash like basketballs.